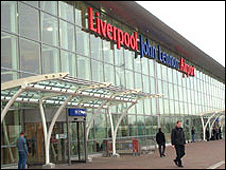 A "militant atheist" who left explicit images in a prayer room at Liverpool John Lennon Airport has been given a six-month suspended sentence. Harry Taylor, 59, of Salford, left images of religious figures in sexual poses on three occasions in 2008. Jurors found him guilty of causing religiously aggravated intentional harassment, alarm or distress in March. He was also given a five-year Anti-social Behaviour Order (Asbo) at Liverpool Crown Court. Among the posters, one image showed a smiling crucified Christ next to an advert for a brand of "no nails" glue. In another, Islamic suicide bombers at the gates of paradise were told: "Stop, stop, we've run out of virgins." Taylor, of Griffin Street, in Higher Broughton, told jurors he was sexually abused by Catholic priests as a youngster. But he said he bore no grudge against people of faith and claimed he was merely trying to convert believers to atheism. Some of his cartoons went far beyond exercising freedom of expression, prosecutor Neville Biddle said. One image showed a pig excreting sausages with insults to Islam, and others linked Muslims to attacks on airports. The chaplain at the airport was "severely distressed" by the discoveries, the court heard. Taylor was convicted of similar offences in 2006. There were dramatic scenes at the sentencing hearing. While Judge Charles James told Taylor's barrister Brigid Baillie he was considering making him pay costs, the defendant began wheezing. Judge James adjourned the hearing for 10 minutes for a first-aider to be called. Taylor left the court room but returned shortly afterwards. Judge James said: "Not only have you shown no remorse for what you did, but even now you continue to maintain that you have done nothing wrong and say that whenever you feel like it you intend to do the same thing again in the future." Taylor's Asbo bans him from carrying religiously offensive material in a public place. The six-month prison sentence was suspended for two years. Taylor was also ordered to undertake 100 hours of unpaid work and pay £250 costs.